The froe had a couple of dozen other names as well, including "riving ax". It was used to split off pieces from a log. Depending on how large and long the log was, everything from withes to shakes and shingles were produced in the woods. By straining the bolt, held in a crotch, while twisting the froe with its handle, the river (as in user of a riving axe) could steer the split any way he wanted. 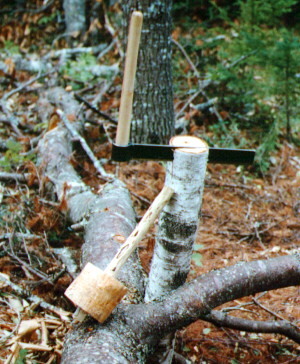 The froe had an edge with a pretty obtuse angle, so that if a logger referred to his ax as "a froe", it was understood that his ax needed sharpening! The maul was used to drive the froe into the wood -- an iron maul couldn't be used without damaging the froe. The one shown here was quickly made from beech wood. Early loggers used similar mauls -- but about half again larger -- to drive their felling wedges.